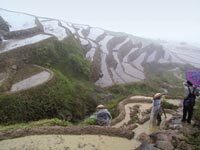 Land use in China is in for irretrievable change. At the Third Plenum of the 16th Party Congress, held October 11-14, 2003, the world's biggest communist country promised to protect private property and allow farmers to amass large land holdings. According to state-run television, these decisions were part of a package to "perfect several issues in the socialist market economic system." These decisions will now be sent to the Standing Committee of China's legislature, which will turn them into law. The plenum, presided over by President Hu Jintao and attended by 188 members and 154 alternates of the Central Committee -- which sets policy for the 60 million-member Communist Party of China -- marks a further move away from the belief in the primary importance of state-owned industries. Delegates agreed to continue supporting state-owned firms, while encouraging private companies to enter sectors previously closed to them, such as infrastructure and public utilities. Non-state firms will now enjoy the same treatment as other enterprises in fundraising, investment, land use, tax and foreign trade. Since an estimated 700 million of China's 1.3 billion people live off the land, this move could remake the face of agriculture. While the emergence of big farms would increase efficiency, and so take care of competition from foreign foodstuffs under the World Trade Organization regime -- which China is worried about -- it could also rapidly increase unemployment in the countryside, where farmers' incomes have been flat for the past five years. The plenum also vowed to address growing economic gaps between village and city, and the coast and interior, a recognition of inequitable growth. Since 1980, the gross domestic product has tripled; this year, the economy is on track to grow by 8 per cent. But while eastern areas enjoy boom times, people in the country's western and central regions remain largely destitute. The plenum also took steps toward writing a new theory into the constitution as a basis of Communist Party rule. Called the Three Represents, the new theory is the brainchild of Hu's predecessor, former president Jiang Zemin. It essentially says the party should now also represent the interests of the economic and cultural elite: a wry acceptance that the nouveau riche and fast-growing middle class are here to stay, and that the party cannot stay in power if it remains simply the party of the peasants and working class.